Due to changes in the exchange rate, we are unable to post the price at the current time. 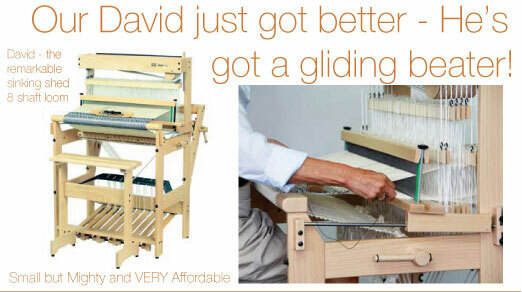 Please email or call us for a quote. We’ve used the same sturdy X-frame, bolt and barrel-nut construction for our Wolf Pup as we use for our other Wolf Looms. We also use many of the same components: steel hub friction brake, brake release foot pedal, aluminum harness channels, and an attached beater pin. 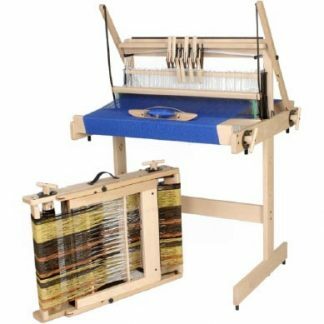 The loom comes with stainless steel heddle bars and a stainless steel reed (choice of 6, 8, 10, 12 or 15 dent), and 300 flat steel heddles (inserted-eye wire heddles also available). The simple and elegant direct tie-up system we use was first designed by F.C. Wood of Waterford, New York, who started building the Dorset Loom in 1956. 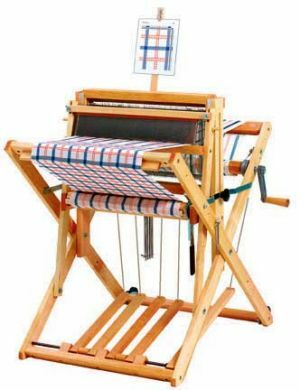 In the process of developing this product, we also came up with a nifty enhancement: the Treadle Tracker, a “mini clipboard” for holding your threading and treadling diagrams. The Wolf Pup folds up to a depth of only 16 inches. 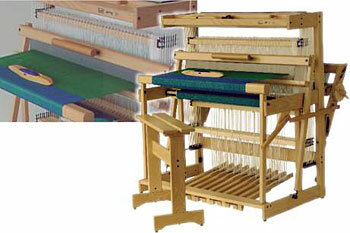 The attached wheels automatically engage when the loom is in the folded position. The Wolf Pup weighs just 38 pounds.